Ryan, Bartholomew. “Kinetic Observation: Viewing Eiko & Koma’s Naked.” In On Performativity, edited by Elizabeth Carpenter. Vol. 1 of Living Collections Catalogue. Minneapolis: Walker Art Center, 2014. http://walkerart.org/collections/publications/performativity/eiko-koma. Eiko & Koma, Naked, Walker Art Center, November 2010. Photos: Cameron Wittig. 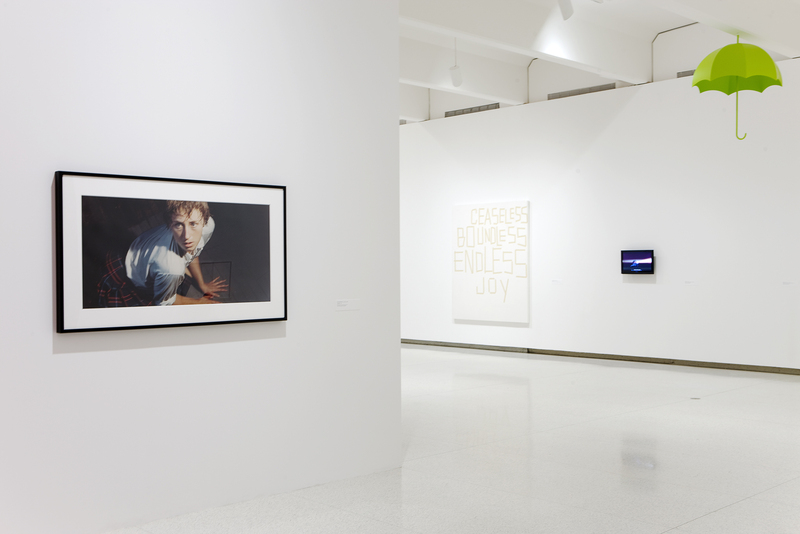 In 2008, the Walker Art Center began to prepare a new collection exhibition for its main galleries, concentrating on art from the late 1950s that engaged various reevaluations of the terms of medium specificity, by way of performative, conceptual, and other strategies. 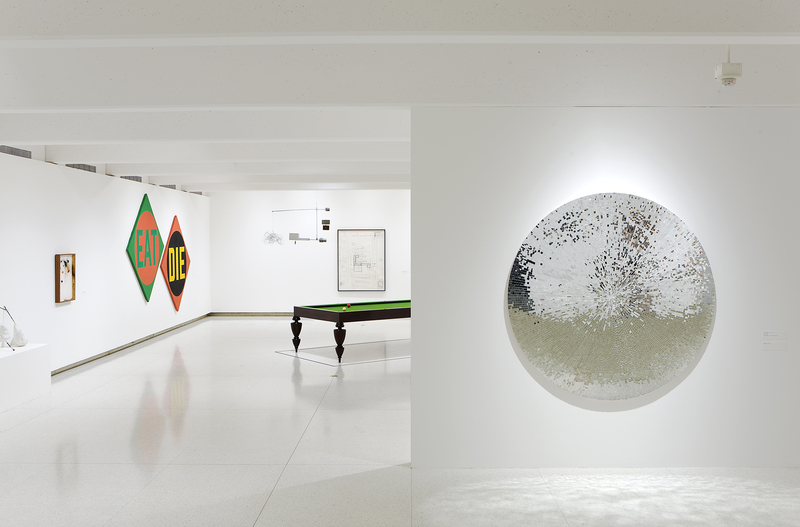 The desire was to speak more fully within a gallery context to the legacy of the Walker’s history as a multidisciplinary arts center, and to network—in an associative, nonhierarchical manner—various points of convergence and divergence among artists within the broad history of artistic practice over the past fifty years. 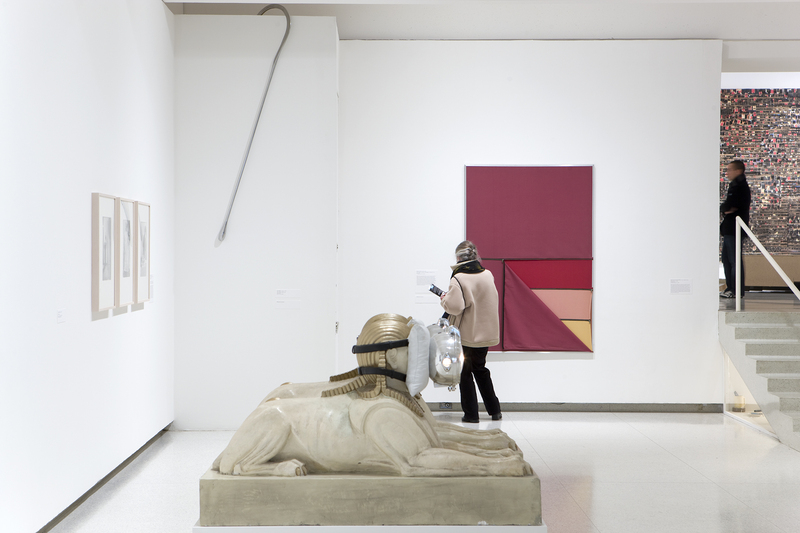 The exhibition Event Horizon continued the Walker’s desire to frame within its understanding of the collection ephemeral, performance-based works. If the Walker commissioned projects by artists such as Merce Cunningham, Jason Moran, or Meredith Monk, could it not also claim that these should be considered part of the institution’s collection and afford them the respect of such an assignation? 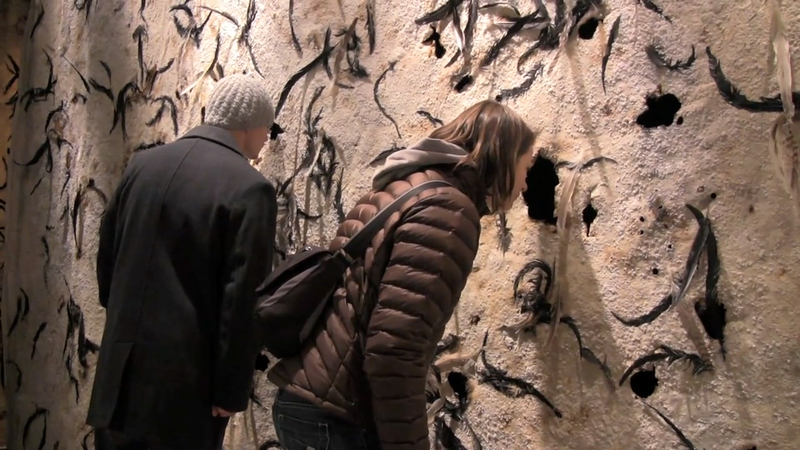 After all, the work had entered the collective memory of Twin Cities audiences; had resulted from deep collaboration between the artists, curators, and Walker support staff; and had lingered materially by way of the documentation, ephemera, and other content that made its way to the Walker’s archives. That so many of the performing artists who have worked with the Walker have returned numerous times makes them part of the institutional, but also metropolitan, memory bank. Installation views of the exhibition Event Horizon, Walker Art Center, February 2010. Photos: Gene Pittman. If the Walker commissioned projects by artists such as Merce Cunningham, Jason Moran, or Meredith Monk, could it not also claim that these should be considered part of the institution’s collection and afford them the respect of such an assignation? 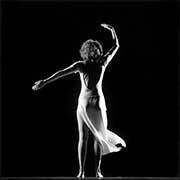 Eiko & Koma, White Dance: Moth, New Dance USA festival, 1981. Photo: Walker Art Center Archives. Eiko & Koma at the Walker Art Center, 2008. Photo: Gene Pittman. It was in this context that Japanese American choreographers Eiko & Koma were invited to make a piece for the exhibition Event Horizon. Ultimately titled Naked, the monthlong “living installation” debuted in the Walker galleries in November 2010.1Eiko & Koma had enjoyed a long history at the Walker, where they had performed twelve separate pieces over the twenty-seven years since their first outing with the institution for the 1981 New American Dance Festival. 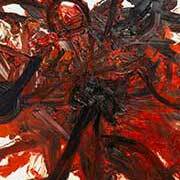 That involvement had included numerous residencies and six commissions. Their work, emerging from an early training in Japanese butoh and German expressionist dance, has developed over the years into a deeply subjective visual/movement philosophy among the most distinctive in US dance, and is perhaps impossible to categorize outside of the evolving terms that they themselves have established around it. 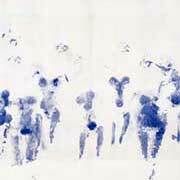 The core of the work is the body stripped bare, metaphorically and often physically reduced to its basic state, and from that tabula rasa exploring its position within the organic and social world. In an era dominated by digital networks of information and communication, where human consciousness is so often dispersed along virtual flows of information, Eiko & Koma locate the body as concrete—lingering, perhaps, and contingent—but essential in its presence and absence. They often draw on mythic narratives of life and nature by way of the particularized gestures of their own forms in space. Some of their works’ titles—Wind (1993), River (1995), Land (1991), Hunger (2008), Grain (2007), Lament (1985)—convey the determinant forces of geography, the elements, and the will to live that act as artistic collaborators in their elaboration of the human condition. 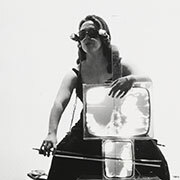 Earning many accolades over the years—including a 1985 Guggenheim Fellowship, a 1996 MacArthur Foundation Fellowship Award, and a 2006 United States Artist Fellowship—the artists also found sustenance in the twin influences of the avant-garde anti-art movements in 1960s Tokyo, and the heterogeneous, individuated, post-formal approaches to performance of 1970s New York. Eiko & Koma had invested deeply in gallery-based work before—Breath (1998) at the Whitney Museum of American Art set an important precedent for Naked. Eiko & Koma were invited to the museum by associate curator of film and video Matthew Yokobosky, who was attracted to the artists for the sculptural qualities they brought to movement and the aesthetic program that had been such a fundamental aspect of their development. 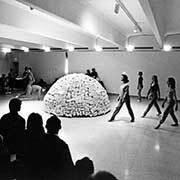 He termed their work, “movement as installation,” making concrete its relation to the history of contemporary art by reference to the immersive environments of installation art. 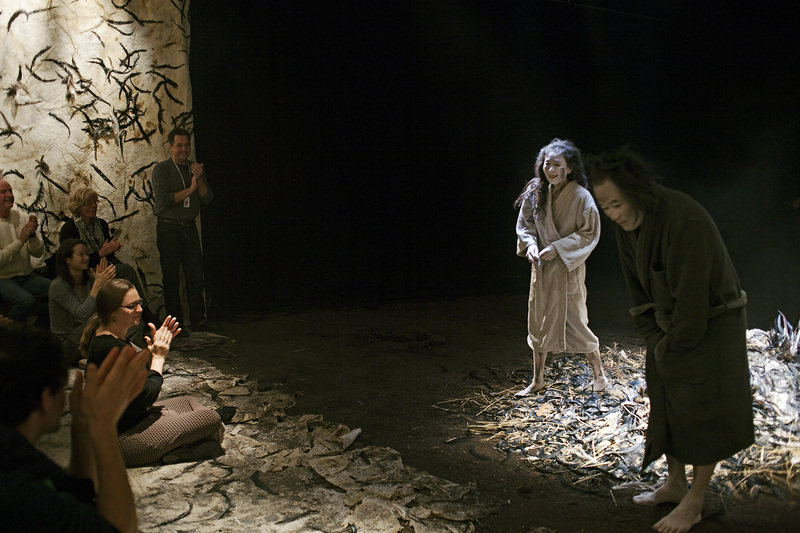 As dance theorist André Lepecki points out, the term fuses “a spatial and a kinetic dimension,” thereby confirming Eiko & Koma’s “fundamental concern in leveling all compositional elements on a non-hierarchical, non-vertical distribution of the sensible.”4 For Breath, Eiko & Koma designed an intricately detailed environment, using tea-stained, hand-sewn silk and thousands of dried leaves in autumnal colors to create a cavelike space. 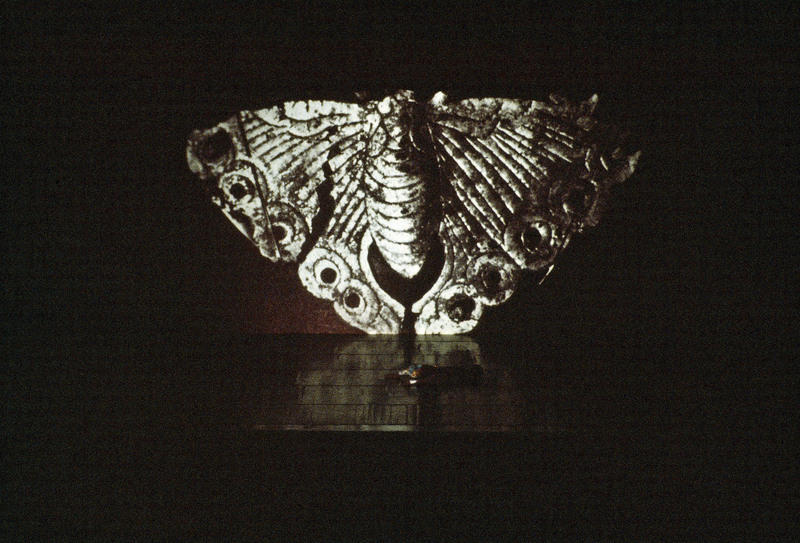 The work included three silent black-and-white videos of the dancers shot from multiple perspectives, which they projected to macroscopic proportions within the gallery; electric fans; and lighting shifts on a 90-minute loop.5 Performed seven hours a day during gallery hours for a full month (May 28 through June 21, 1998), the work concentrated on time and the mutable power of image-making, whether projected or found in the live micro-movements of the dancers. Similarly, Naked took place in an area of the second gallery of the Walker’s 1971 Edward Larrabee Barnes–designed building, an elegant modernist tower with a series of seven galleries spiraling up its interior. Initially, the artists wished to make use of the potential for flow between their space and the other galleries; their thinking was to create an installation that would be visible and open from each of its two approaches, because they felt a strong desire to be in direct dialogue or even conflict with many of the static works on view. An early model for the project, composed in the artists’ New York apartment in the spring of 2010, featured a scaled-down version of a monumental worm, fish, or phalluslike object that they planned to build out of plastic inflatables wrapped in canvas. They wanted to cover it with an orange/red, scorched rice paste representing welts and cankers bespeaking plague or other unspeakable (atomic?) traumas.6 Other materials included a series of large vertical canvases designed to operate as movable screens, which would again be covered with rice paste and salt particles; but these would also contain human hair arranged by Koma into expressionistic sketches of shadowy people, mouths agape, caught in a harrowing moment of figuration. At the time, they discussed ways that the cankerous fish could serve as their bed and shelter that would periodically be dragged, flaking and grotesque, into the wider gallery, where they would remain with it potentially for many hours on any given day. At this point, they were also intending to use video projections, as with Breath, recorded sound effects, and various other external devices to compose the gallery experience. Eiko & Koma performing Breath, Whitney Museum of American Art, 1998. Photo: David Allison, Frances Mulhall Achiles Library Archives, Whitney Museum of American Art, New York. Maquette for an early version of Naked, April 2010. Photo: Bartholomew Ryan. Eiko & Koma working on Naked with their manager, Ivan Sygoda, during a residency at the Park Avenue Armory, New York, September 2010. Eiko & Koma, Raven, Walker Art Center, October 2010. Eiko & Koma, Hunger, Walker Art Center, October 2008. Photo: Cameron Wittig. 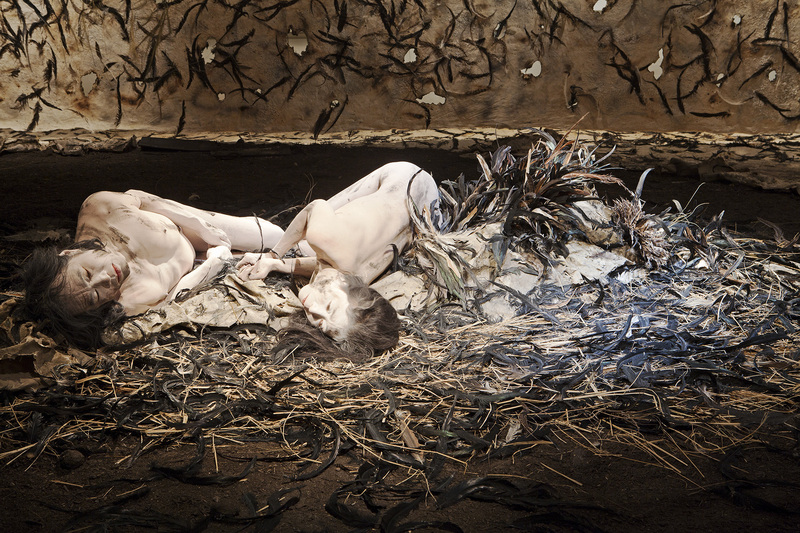 Eiko & Koma, Naked, Walker Art Center, 2010. Naked’s threshold was marked by two giant, perpendicular canvas drops swathed in rice paste, black feathers, and large particles of sea salt. The hanging drops were dappled with scorched holes through which those outside could see in, and from which the lighting, smells, and aura on the interior could leak out into the surrounding gallery. 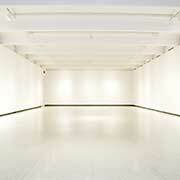 Entering Naked meant passing through two main access points, crossing from gallery terrazzo to seared canvas flooring. 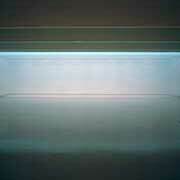 Inside, facing into the space, were two long, low raw-plywood benches with black cushions. To either side there were also benches, so at any one time about twenty people could sit in the space and another ten or so stand behind the main benches or in the entrance corners. The canvas flooring, which determined the limit of the viewer’s reach, extended a few feet in front of the seating before forming a ragged coastline from which a wide sea of damp earth receded into the darkness covering most of the space in the environment. 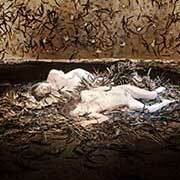 A few feet into the soil was a mound composed of burnt and crumpled canvas, straw, and a mass of feathers. It was here that Eiko & Koma lay, naked and on view. Any sound was generated within the environment itself, by way of the humming of twenty-odd electrical fans, which also created a gentle breeze that blew the feathers on the drops and elsewhere; and also a random dripping of water onto the soil that came by way of six plastic bottles of frozen water hung from the rigging so that their open caps faced the ground.16 For the viewer, the source of the drips was unknown, and was often a cause of fascination, creating a sometimes eerie accompaniment to the moving bodies of the dancers. 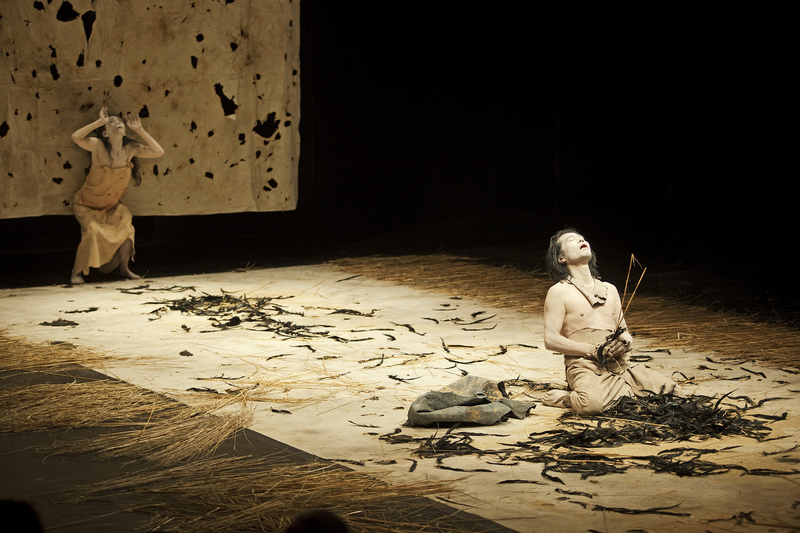 For six hours a day, six days a week, from November 2 through 30, 2010 (with a break on Thanksgiving Day), Eiko & Koma were present together in Naked. 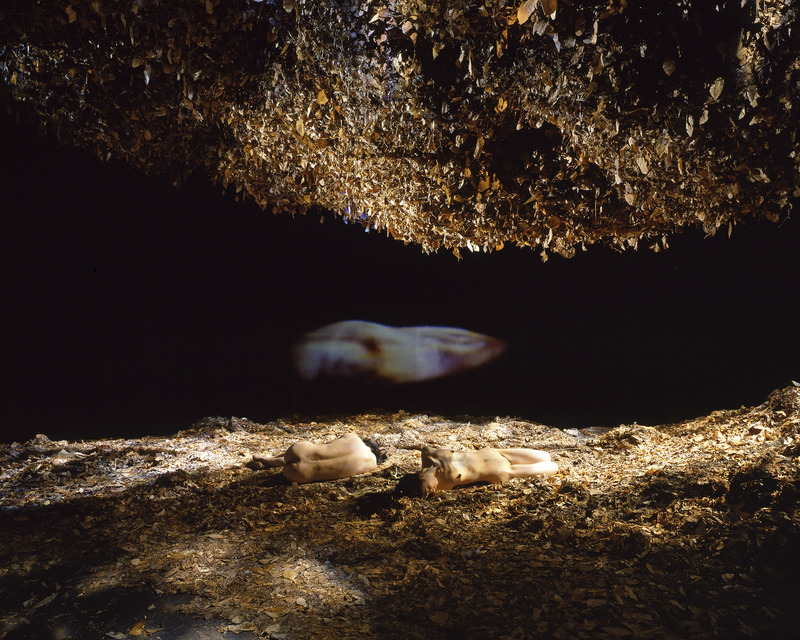 A viewer who entered the space at any time would see Koma lying, often in fetal position, on the right of the mound, and Eiko to the left, her body largely parallel to his. Both lay with their heads toward the audience. Where Koma was something of an anchor, rarely moving his entire body out of his initial position, though often turning his head backwards so his eyes roamed over the audience, Eiko would move more readily, sometimes rolling gradually away from the island, or lying on her back, legs searching out Koma’s or stretching across the soil. Often she would press her feet into the ground and push her body up into the air where it would roll gradually through space before allowing itself the respite of the ground again. She, like Koma, would also tilt her head toward the viewers, her eyes a key affective aspect of the viewer’s experience though nevertheless difficult to define, agonized perhaps, or preoccupied. Their bodies, covered entirely with white makeup, were slim and toned, but also aging and tired. Meanwhile, the lighting moved from warm to cold on the mound itself, accentuating shadows, muscle tone, and the eyes to different degrees during its 30-minute looped cycle. An emphasis was also put on the canvas drops, lit from the outside but also from within, with all-over floods, or subtle accentuations of various parts. Indeed, the area where the audience sat was not dark, but also became organically connected to the rest of the environment, likewise rising and falling in luminosity. The general effect was one in which exterior and interior, soil and canvas flooring, benches and raft, viewers and dancers, seemed to live within one complex ecosystem. Naked: A Gallery View, November 18, 2010, filmed and edited by James Byrne in collaboration with Eiko & Koma. ©2011 Eiko & Koma. Where Eiko & Koma acted as a locus for the living installation, much of the choreography involved the coming and going of the viewers themselves, the “kinetic observation” that was less voyeurism than an embodied negotiation of the terms of one’s own involvement in relation to (all) the other individuals in the space. Each person’s choreographic contribution was driven by some of the following questions: Is it easier to leave when others remain? What is it like to be alone with Eiko & Koma? To leave them when they’re alone with no one else to witness? To witness with your child? With a stranger? With a parent who is aging? To be that aging parent looking at a body a few feet from yours that is aging too? How does the piece relate to one’s own suffering: the pain of living, the person whom you have lost or who has been drifting away? What would it mean to have a companion like this? 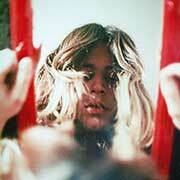 To be so intimately conscious and unconscious alongside? What is it to depart into the bright lights of the Walker galleries, the artworks unpopulated, static remnants of some past practice? Is it to lose something very unusual, and maybe even longed for? 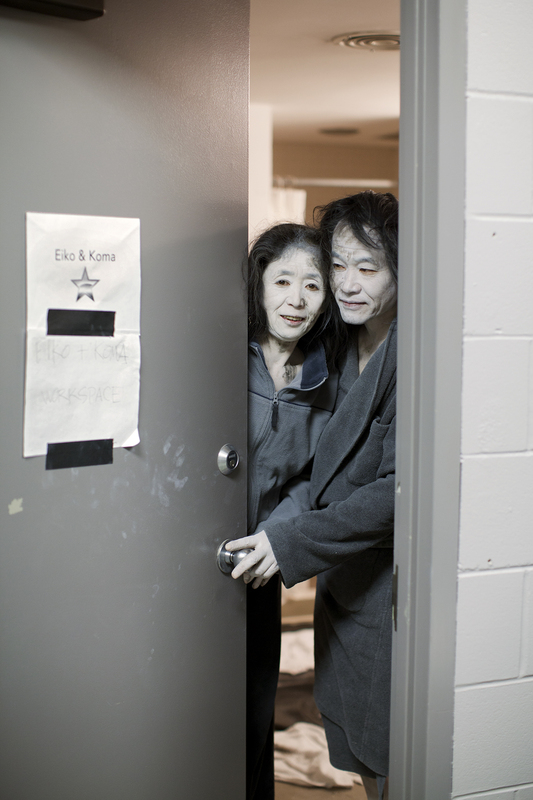 Eiko & Koma during a break in their performance of Naked, Walker Art Center, 2010. In discussing some of the ideas or mind pictures that helped shape Naked, Eiko & Koma have referred, among other sources, to shinjū, the double suicide of lovers that is a key theme in Japanese mythology.19 Frequently, such relationships were doomed by distinctions of class, age, or clan, and the bond considered so shameful that the corpses would be denied funeral rites and left to decompose on the banks of a river. Lepecki writes about the artists’ relationship to the ground, so vital to so many of their works: “On the ground, their embrace of the horizontal is rather the activation of a necessary regime of quietness in which the body must become a conduit for micro-movements and align itself with a temporality that approximates it to a time-image; and with a horizontality that approximates it to the forces of the earth, turning a body into a kind of thing.”20 That Lepecki concentrates on the horizontal is appropriate, as few other terms can arrive at the key position, both literal and metaphorical, that the artists have occupied deliberately for so long. In turning the body into a kind of thing, they open it to many possibilities, and neutralize the socialized hierarchies that would otherwise beset it. The grim end that the double suicide implies is infused with the ameliorating spirit of Eiko & Koma’s white dance when one considers the horizonal ethos that has driven them to consider it. In love, they bypass human prejudice and see each other as equals. Love’s horizontality allows them to make that greatest affirmation of life: the choice to leave it. In decomposing on the riverbanks, they may not enjoy human death rites, but these rites themselves have already been called into question, part of a social sphere that has made their love impossible. They have become “a kind of thing” on the banks of a river, and in this sense they are no better or worse than all the other kinds of things that populate the Earth. This horizontality is an assumption, through love, of passage between states, an acceptance of and veneration for the primordial generative status of atoms and cells, and the cycles of dissolution and revolution that drive them. It is the same horizontality that transforms the “audience” into the family member, and the “performer” into the patient who is being cared for by them, looking out the window at the clouds. Walker staff gathered in the gallery near the close of the final performance on November 30, 2010; when associate curator Doug Benidt called time at 5 pm, the artists received an ovation from the crowd. Bartholomew Ryan is an assistant curator at the Walker Art Center in Minneapolis, where he has been on staff since 2009. In 2013 he curated 9 Artists, a multigenerational group exhibition (with catalogue) that considers the changing role of the artist in contemporary culture, which opened at the Walker and traveled to the MIT’s List Visual Arts Center. Prior to that, Ryan co-curated Painter Painter (2013; publication); Pedro Reyes’ Baby Marx (2011); Goshka Macuga: It Broke from Within (2010; publication); and Eiko & Koma’s Naked (2010). Forthcoming projects for which he will serve on the curatorial team include Ralph Lemon’s Scaffold Room (2014) and International Pop (2015). Ryan holds an MA from the Center for Curatorial Studies at Bard College (2009) and has contributed to international publications such as Metropolis M, Kaleidoscope, and Artforum. The practical aspects of developing Naked involved a team from the Walker’s visual arts, performing arts, and events & media production departments working closely with the artists on a complex installation process. Institutionally, there were many logistical questions to be worked out. For example, the visual arts department conventionally works with one set of technicians who are highly specialized at gallery-based installations, whereas the performing arts department works with event-based technicians, skilled at installing sets and programming lights and dealing with the myriad concerns that come with live performance. As Naked required theatrical lighting, programming, and so on, it was decided that the event-based technicians would work on the installation in the galleries, a space with which they were unaccustomed, and deal restrictions such as a comparatively low electrical capacity for lighting effects. What made this approach successful was that support staff had worked with Eiko & Koma in the past, and had very open lines of communication. They were able to be responsive to the artists’ process, which is highly organic and participatory. The project was a work-in-progress until opening day, at which point the environment was established and lighting cues set. Eiko & Koma then began the long process of exploration of the piece in relation to its public, the 7,500 people who visited the installation throughout the month of November. Special thanks go to Christian Gaylord, Pearl Rea, Ben Geffen, Andy Underwood-Bultmann, and Peter Murphy. I’d also like to take this opportunity to thank Doug Benidt and Philip Bither, with whom I co-curated this project for the Walker. Doug and I worked closely on logistics, and, during the life of the exhibition, divided the task of making sure the artists’ daily needs were met. As such, he and I share the memory of what it felt like to empty the installation so that Eiko & Koma could take much-needed breaks and to watch them briefly turn into energetic lovers of hot soup and pizza. Miller’s own words perfectly describe his reasoning for making the invitation: “Eiko & Koma are their own clay. It has been forty years since they started working together, so you could say it has not been fired but aged. We need to look back with them, for them, and for others—to recover or reimagine what we can, in hopes that the remaking will take on its own shape, though still from the same clay.” Sam Miller, “The Limits of Language,” in Time Is Not Even, Space Is Not Empty, ed. Joan Rothfuss (Minneapolis, MN: Walker Art Center, 2011), 283. The many and still evolving parts of the three-year Retrospective Project include a visual arts exhibition composed of video, photographs, and environments from their 40-year career, titled Time Is Not Even, Space Is Not Empty, which opened at Wesleyan University’s Zilkha Gallery in November 2009; a retrospective catalogue produced by the Walker Art Center; reprisals of key works such as White Dance; a distinct exhibition at the Museum of Contemporary Art Chicago in the summer and fall of 2011; and many national and international engagements. André Lepecki, “Reciprocal Topographies—Eiko & Koma’s Dancesculptures,” in Time Is Not Even, Space Is Not Empty, ed. Joan Rothfuss (Minneapolis, MN: Walker Art Center, 2011), 49. Joan Rothfuss, “Catalogue of Works,” in Time Is Not Even, Space Is Not Empty, ed. Joan Rothfuss (Minneapolis, MN: Walker Art Center, 2011), 192. This stage of the project involved a number of studio visits by the curators, each of whom encountered the model and discussed it in depth with the artists. The visits were made in the spring of 2010 by Philip Bither, William and Nadine McGuire Senior Curator, Performing Arts; Doug Benidt, Associate Curator, Performing Arts; and myself. This insight was made in a conversation about the artists’ Delicious Movement workshops, an ongoing aspect of their pedagogical practice. Paula Josa-Jones, “Delicious Moving,” Contact Quarterly (Winter 1986): 59–60. Eiko & Koma addressed this concern during their conversation with Philip Bither for a Talking Dance program at the Walker Art Center, Minneapolis, October 28, 2011, accessed January 20, 2012, http://channel.walkerart.org/play/talking-dance-eiko-koma/. The journey from invitation to the realization of Naked involved gradual exploration, decisions, and revision for Eiko & Koma. They relied on their own generative ideas complemented by a feedback loop of consideration and response from a series of close collaborators they had learnt to trust over the years. The list included producer Sam Miller; Walker curators Philip Bither and Doug Benidt; the artists’ sons Shin and Yuta; their assistants, especially Lydia Bell; their manager, Ivan Sygoda; and former Walker associate curator Doryun Chong. Interview with the artists by Philip Bither, “Naked: Time Is Not Even, Space Is Not Empty,” Walker magazine (November/December 2010): 15. Indeed, Sam Miller celebrates the way in which the Retrospective Project throws this tendency into tighter relief, presenting “an accumulation of elements made over time … serving as both reflection and prophesy—new work made from old, old work emerging from new.” Miller, Time Is Not Even, 283–284. 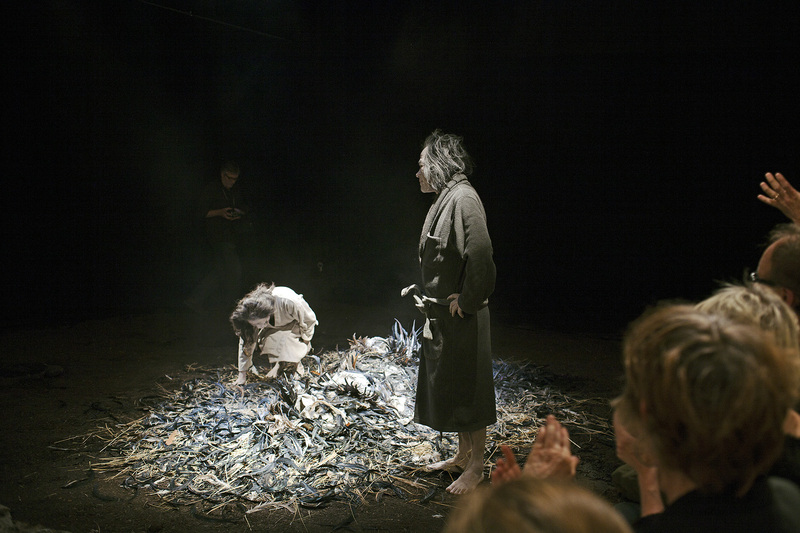 An aspect of Eiko & Koma’s residency at the Walker in the fall of 2010, which led up to and included Naked, involved a performance of Raven in front of 300 children and parents as a Free First Saturday event on October 2, 2010. 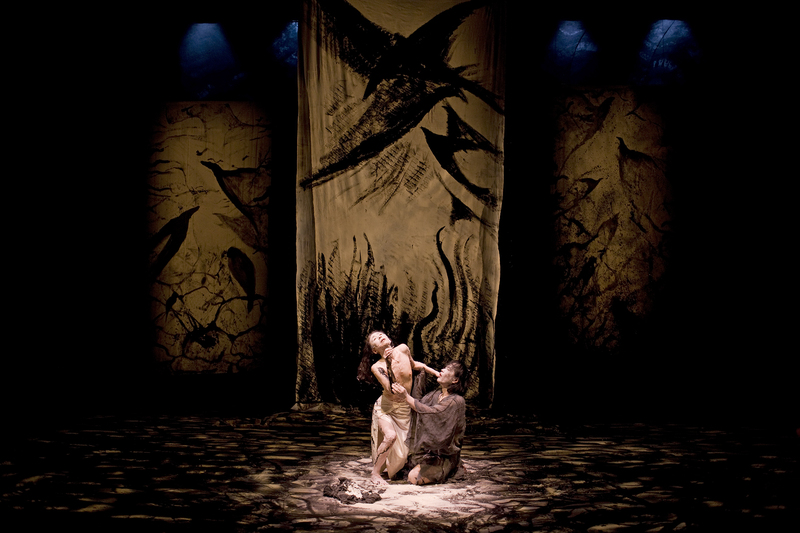 In a continuation of the theme of recycling bodies and materials, Peace (Setpheap Sorn) and Charian (Chakreya So) had worked with Eiko & Koma previously on Cambodian Stories (2006) and Cambodian Stories Revisited (2007). These projects emerged from a 2006 residency at the Reyum Institute of Arts and Culture in Phnom Penh, Cambodia. Rothfuss, Time Is Not Even, 247. Miller, Time Is Not Even, 284. During the summer of 2010, while engaged in an artist residency at the Park Avenue Armory, a recorded soundtrack had been developed composed of extracts from the work of the Kronos Quartet and the sounds of birdcalls that had been used in Raven. By the time Naked opened, however, these extraneous recorded sounds had been stripped away. In conversation with the author during the lead-up to Naked, Eiko referred to shinjū as one of its sources. It should be noted that the artists draw from many places, and the work should not be read simply from this one mediating frame. See also Doryun Chong, “Even a Dog That Wanders Will Find a Bone,” in Time Is Not Even, Space Is Not Empty, ed. Joan Rothfuss (Minneapolis, MN: Walker Art Center, 2011), 67. Lepecki, Time Is Not Even, 50.